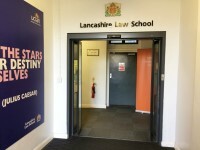 Services / facilities within the building include the School of Built and Natural Environment, including labs and studios, the Lancashire Law School, including a mock courtroom and a drama studio. 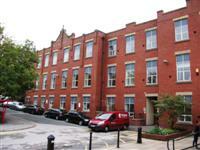 You are on Parking (Edward Building). Skip to the next section. 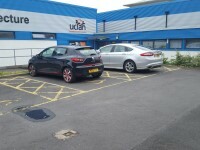 The car park is located in front of the Edward Building. 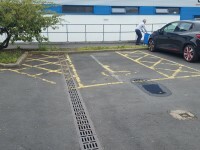 The dimensions of the Blue Badge parking bay(s) are 410cm x 469cm (13ft 5in x 15ft 5in). The nearest Blue Badge bay is 44m (48yd 4in) from the rear entrance. 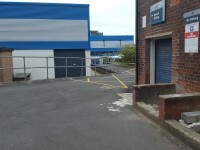 The furthest Blue Badge bay is 53m (57yd 2ft) from the rear entrance. 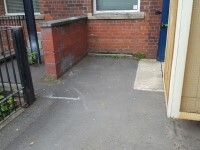 The width of the ramp/slope is 138cm (4ft 6in). 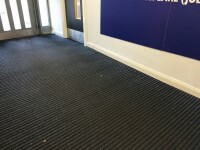 The step(s) is/are located at the front of the main entrance. 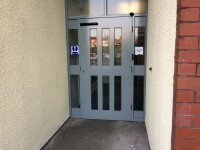 The second photograph shows the steps immediately inside the first set of doors, they are of medium height and are clearly marked with hand rails on both sides. 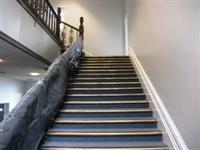 You are on Other Floors (Ground Floor Stairs). Skip to the next section. 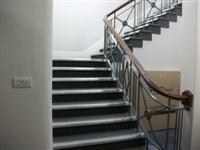 These stairs are located at the far end of the corridor from the accessible entrance. 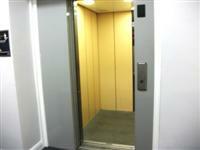 You are on Lift (Ground Floor Lift). Skip to the next section. 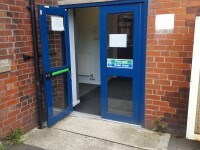 The lift is located to the left as you enter the accessible entrance. 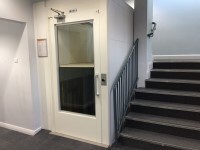 The lift is approximately 25m (27yd 1ft) from the accessible entrance. 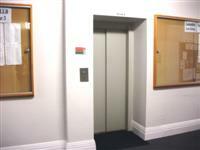 The dimensions of the lift are 103cm x 139cm (3ft 5in x 4ft 7in). 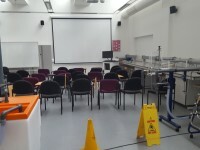 The area(s)/service(s) on the floors which are not accessible is/are Rooms HB318 and 318a on the landing. 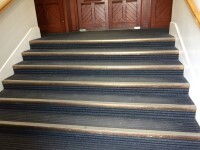 These stairs are located just inside the main entrance. 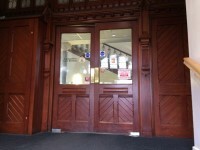 The lift is located at the front of the building. 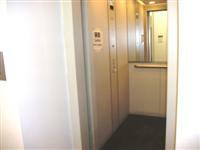 The lift is 35m (38yd) from ground floor lift. 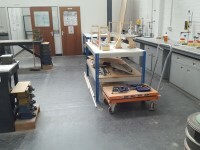 The dimensions of the lift are 102cm x 131cm (3ft 4in x 4ft 4in). You are on Link into the Foster Building. Skip to the next section. 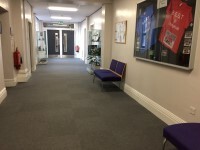 There is a link in the first floor corridor that leads into the Harris Building. 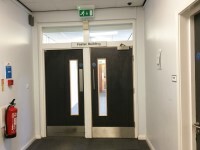 There are two heavy single doors that open both ways with a width of 90cm. 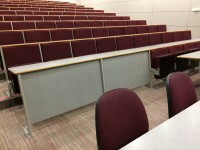 There is/are 7 medium (11cm-17cm) step(s) for access to the lecture theatre(s). 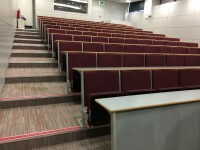 The steps to the staggered seating do have handrails. 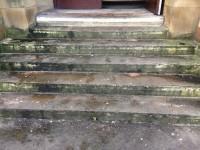 The steps have handrails on the left going up. 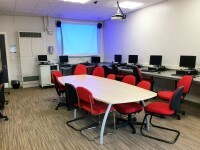 There is a hearing assistance system for the lecture theatre(s) available on request. 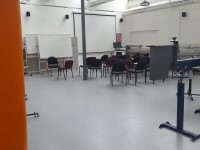 You are on Lift (Theatre). Skip to the next section. 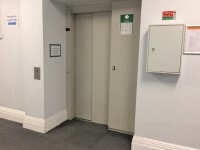 The lift is located on the first floor leading into the lecture theatre. 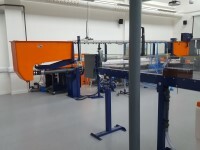 The dimensions of the lift are 95cm x 153cm (3ft 1in x 5ft). 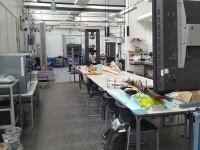 You are on Level Change (Second Floor). Skip to the next section. 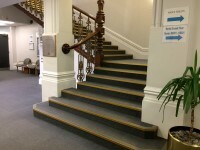 The ramp or slope is located by the ground floor stairs. 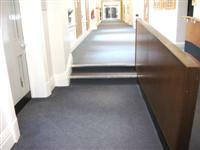 The width of the ramp or slope is 91cm (2ft 12in). 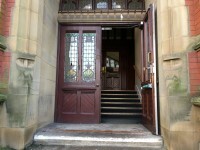 The steps are located by the ground floor stairs. 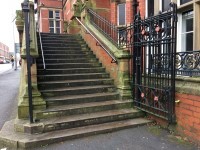 The ramp overcomes the steps mentioned, and has handrails both sides. 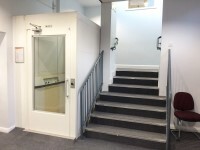 The ramp and steps can also be overcome by using the two lifts on the first floor. 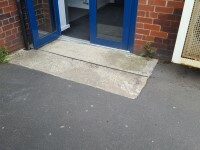 The ramp or slope is located directly to the right as you exit the lift. 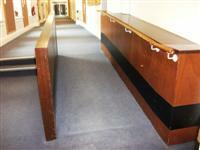 The width of the ramp or slope is 99cm (3ft 3in). 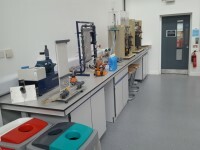 The steps are located leading off the third floor corridor. 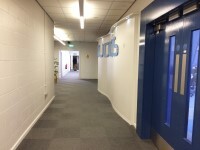 There are two sets of steps leading off the corridor, leading to staff offices HB316, 317, 319 and 320. 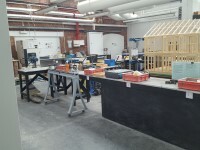 You are on Civil Engineering Workshop. Skip to the next section. 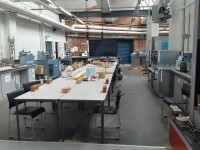 The Civil Engineering Workshop is to the left when you enter the rear entrance. 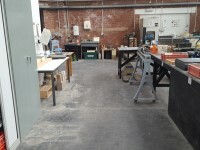 There is a heavy door 110cm wide to enter the workshop. 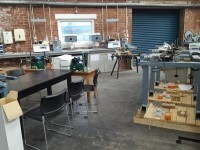 Within the workshop there are various tables with measuring equipment and apparatus. 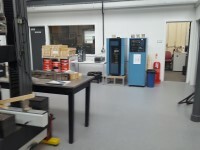 The work shop floor is a concrete surface and level. There are chairs to rest and sit on if required with no armrests. 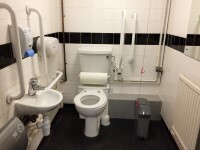 This accessible toilet is approximately 15m (16yd 1ft) from the main lift. 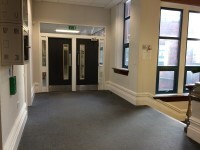 There are additional accessible toilets on all floors. 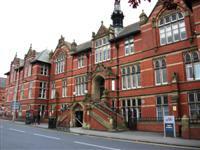 The female toilet facilities that were surveyed are located on the first floor, left as you exit the lift. 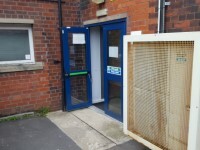 The female toilet(s) is/are approximately 15m (16yd 1ft) from the ground floor lift. 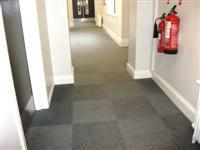 The male toilet facilities that were surveyed are located off the ground floor corridor. 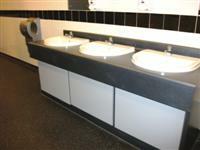 There are also standard toilets available on the second and third floors.